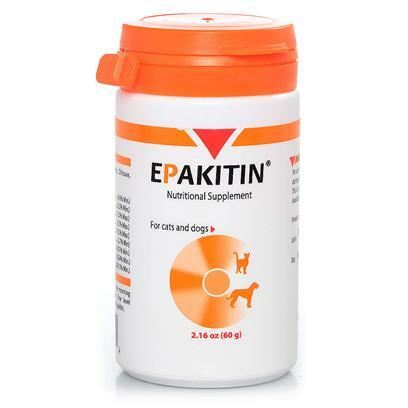 Epakitin is a chitosan, calcium carbonate, lactose and hydrolyzed soy protein based nutritional supplement/food supplement. Chitosan is a natural polysaccharide extracted from crab and shrimp shells. Lactose and hydrolyzed soy provide protein and carbohydrates. All ingredients are listed in the American Association of Feed Control Officials as GRAS (Generally Recognized As Safe). No known side effects. Allow free access to fresh water while using this product. Keep out of the reach of children. Active Ingredients: Calcium Carbonate, Chitosan. Inactive Ingredients: Hydrolyzed Soy Protein,Lactose. Give orally 1 gram per 11 lbs (5 kg) of body weight in the morning and the evening mixed with food. One level dosing spoon (provided) contains 1 gram of Epakitin. Allow free access to fresh water while using this product. Administration can be life long.